It's hard for us to remember all the settings in Word application, such the formatting marks settings and the show document content settings. We may need to show / hide or toggle the formatting marks on and off now and then, such as to show or hide paragraph marks, to toggle the hidden data or text on and off. Since all these settings are locating in separately in Word, it's not easy for us to remember and apply them when we need to. 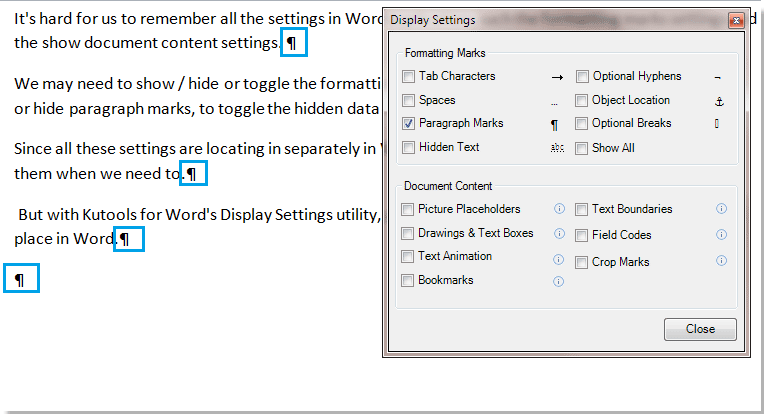 But with Kutools for Word's Display Settings utility, you can quickly apply following settings from one place in Word. 1. Apply the utility by clicking Click Kutools Plus > Display Settings. 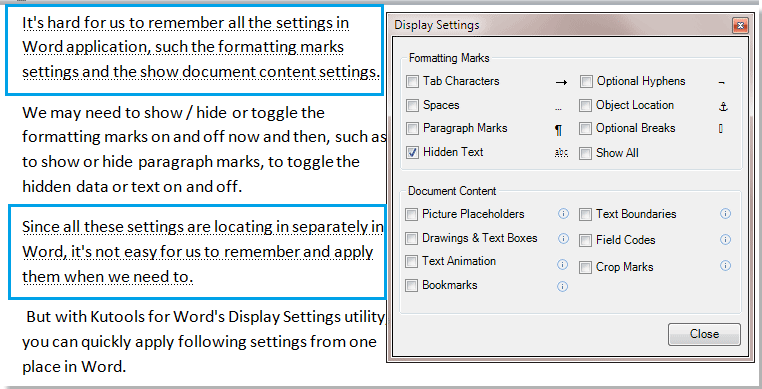 Please checked Paragraph Marks option in the Display Settings dialob box as shown in the below screenshots, and click Close button. You will see the paragraph marks displaying in your document as shown in the below screenshots. 1. Apply the utility by clicking Click Kutools Plus > Display Settings. Please checked Hidden Text option in the Display Settings dialob box as shown in the below screenshots, and click Close button. You will see the hidden text or data displaying in your document as shown in the below screenshots. 1. Apply the utility by clicking Click Kutools Plus > Display Settings. 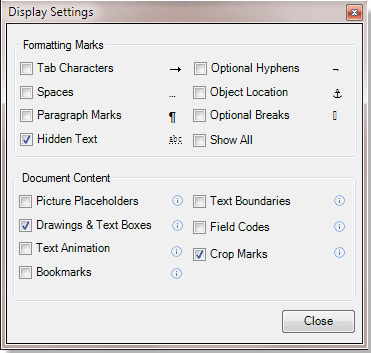 Please checked Tab Characters option in the Display Settings dialob box as shown in the below screenshots, and click Close button. 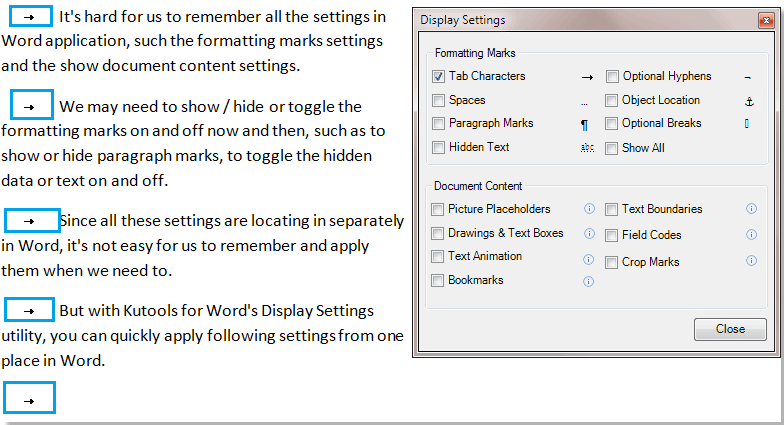 You will see the tab characters displaying in your document as shown in the below screenshots. 1. Apply the utility by clicking Click Kutools Plus > Display Settings. Please checked Tab Characters option in the Display Settings dialob box as shown in the below screenshots, and click Close button. You will see the field codes displaying in your document as shown in the below screenshots.